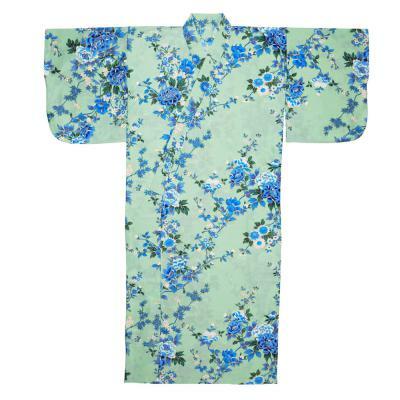 This women's kimono has peonies highlighted in gold and set against a pale green background. In Japan, the peony is symbolic of riches and honor, and is also known as the king of flowers. The sakura blossom is a metaphor for the fleeting nature of life. This Japanese kimono is made of soft, luxurious 100% cotton sateen. This robe is perfect for use as loungewear, a robe or as a cover-up at the beach or pool. Made in Japan, this kimono has traditional butterfly sleeves and a matching belt. This women's kimono is available in four sizes: Small, Medium, Medium/Wide and Large. Small, measures 54" in length and is designed to fit a woman 5' 3" to 5' 6" in height. Medium, measures 56" in length and is designed to fit a woman 5' 6" to 5' 9" in height. The sleeve length is 13", the shoulder width is 24" and the girth is 45". If you are looking for a shorter robe, see our Happi Coats which are shorter length versions of the yukata. These robes make gift giving so easy and everyone loves them. The quality of work is superb.